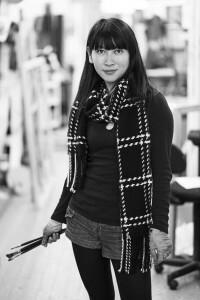 June Li is a painter and graphic designer, trained in Visual Art at South China Normal University and in Studio Art at Sonoma State University. June has created commercial designs for such clients as Sephora, YouTube, Salesforce, Disney and Safeway. Her paintings can be found in public and private collections in China, Florence, London, and the U.S., including a recent commission for the new San Francisco 49ers Levi’s Stadium art gallery and a large 3D heart painting for the 10th Anniversary Hearts of San Francisco project. June is a member of Art Span, Art Explosion Studios, and Mission Artist United.